By Jonathan Cooper, University College London, Ilektra Christidi, University College London, Thomas Etherington, Royal Botanic Gardens Kew, Caroline Jay, University of Manchester, Martin O’Reilly, The Alan Turing Institute, Melody Sandells, CORES Science and Engineering Limited, Andy South, Freelance. This post is part of the Collaborations Workshops 2017 speed blogging series. 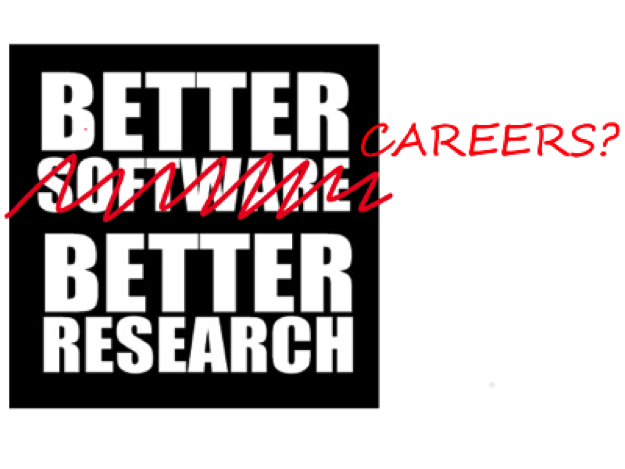 “Is there an alternative to the standard academic career path that would actually make research work better?” There are many essential roles that make up a team. At present, the creativity and skills of those outside of a principal investigator role are often hidden behind academic power structures that do not necessarily represent the contributions of the wider research team. Could rethinking the way we understand the roles that people play within research teams not only improve the careers of those individuals, but also be a huge step forward in the way we conduct science? PhD, post doc, lecturer… possibly. This model has represented the status quo in universities for years, and naturally constrains the way in which research teams are formed. We are now in the era of portfolio careers, however, and as science moves from a hierarchical to a more team-based activity, perhaps it’s time to rethink the model. A less rigid approach to building teams would make it possible to incorporate the skills required for particular projects, without pigeonholing people with job titles that dictate their status and limit their contribution. Some people are better at writing grants and papers, others are better at writing software; many are good at both. In a university environment, a team might need a domain expert, a statistician, a lab tech, a data scientist, a software engineer, a teacher, and the person who plays each role, or the role that each person plays, may vary according to the requirements of the project. A flexible approach to team building is more common in industry. Would it be better for research to follow this in universities too? Currently within academia there is nearly always only one type of hierarchy, culminating in being a lab head or principal investigator, and one route to get there (via postdoc to bringing in your own funding). The fortunate few who get to lead a lab then spend all their time managing research, rather than being hands-on. Even within a research software engineering (RSE) team, advancement towards “head of group” requires taking on management responsibilities, which may not be the best use of RSEs’ skills. Can different specialisms have promotion based on technical expertise rather than this being reserved for those who move to managerial positions? These roles could include mentoring junior colleagues, and/or involvement in more complex projects where their skills are needed. This would allow more varied and nuanced progression and recognition, rather than a one-size-fits-all model. It would keep hard-earned expertise within the research group, potentially by extending the benefit of permanence to those outside traditional academic roles. In just a few years, the role of a “central” RSE team has become well established. There nevertheless remain many more people who work alongside researchers within research groups, mostly but not exclusively on software. The role of such an “embedded” RSE is a less well-defined one, and it is thus harder to understand how they should get credit for their work. These people may be researchers/postdocs, or postgraduate students who code a lot, or freelancers/contractors hired for short-term projects to fill holes (or use up funds that are not enough to hire a full employee). One common characteristic between them, though, is that they attempt to retain “one leg in each boat”, trying to keep publishing, as well as honing their software skills, in order to maximise their skill set for future academic positions. If we’re going to have roles like RSEs, where credit and success are not just measured in papers, how do we ensure that we have “credit transfer” across the different roles to allow people to move between them as they progress their career? If people’s contributions to projects are measured in more detail and credited accordingly, rather than just being credited for papers, then it would make it easier for them to move both between research and coding and between academia and industry. What incentives and transformations in recognition frameworks are needed to make this a reality? While credit for papers is still quite focused on publication venue reputation or impact factor, this is not currently the case for software or data. Do we need to wait for the measures used for journal papers to catch up or can we get ahead of the game on measures of success/impact for these sorts of outputs? How do we incentivise communal good, not just personal advancement? Finally, research is not just the purview of universities. How do we facilitate the involvement of individuals outside academia? “Citizen science” is of course a major player in this realm, but there is also much work done by freelancers or contractors, earning an income for their contributions. There are often constraints in university human-resources departments that can make involving such people in projects difficult. Perhaps research would benefit from the digital skills and start-up culture associated with open data, the Internet of Things and mobile app development. What is needed to achieve this? This article has focused rather heavily on questions rather than answers! The best route forward is as yet unclear. But we hope to start a conversation that might ripple through the research landscape, making it a better place for all of us, and, more importantly, significantly improving the quality of the science and innovation we produce.